Lonesome Lost & Foggy is one of Pittsburgh's premier Bluegrass Bands. LL&F have played at some of Western Pennsylvania's top Bluegrass festivals including the January Ice Jam in Butler, PA and the Oil City Bluegrass festival as well as performing on the main stage of the Three Rivers Arts Festival. The band was formed when a few friends from Duquesne University teamed up with a few fellas at the Starlite Bluegrass Jam on Tuesdays in Blawnox. The band has played with groups such as the Jacob's Ferry Stragglers, Allegheny Drifters, Echo Valley, Well Strung and many more. LL&F focuses on Traditional Bluegrass with 3 part gospel harmonies. The band also writes original songs in the bluegrass genre. Look for us at upcoming festivals and anywhere great live music is performed. If you have need for a bluegrass band, make sure to head over to the Contact page and send us a request! 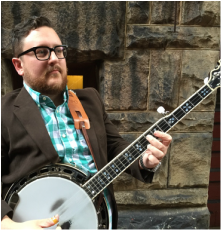 Corey Wood - Plays guitar/fiddle/mandolin/banjo and whatever else the song calls for in LLF. He also sings Lead/Harmony vocals. 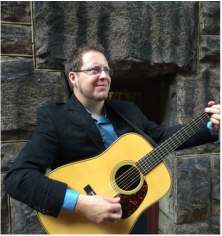 Corey has played Bluegrass music from a very early age and excels at every instrument he puts his hands on. He plays through out the Pittsburgh area and beyond. Andy Leer - Is Lonesome Lost & Foggy's banjo player. 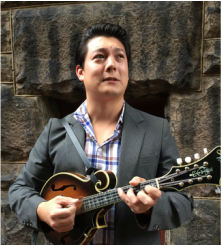 He has played banjo since age 14 and is a classically trained Jazz Pianist. He applies his chordal theory and melody work to his banjo playing and loves every chance he gets to use his Bill Keith D-Tuners. Andy has a background in audio engineering as well and applies that to engineering a solid sound for the band. Andy is by far the most handsome member of the band. Lee Hintenlang - Is a classically trained saxophonist. But since Bluegrass doesn't need a saxophone, he plays mandolin/guitar and sings sweet Harmony Vocals. Lee also sings Lead on a few songs as well. He grew up in a house of music with a music teacher for a mother. Lee has played in many bands around Pittsburgh. Valerie Wood - Has joined the band recently as our stand out stand up bass players. New to the instrument but not to bluegrass, Valerie holds down the bass line. When she's not playing bass, she and Corey Wood (husband) play wonderful duets on guitar and mandolin.